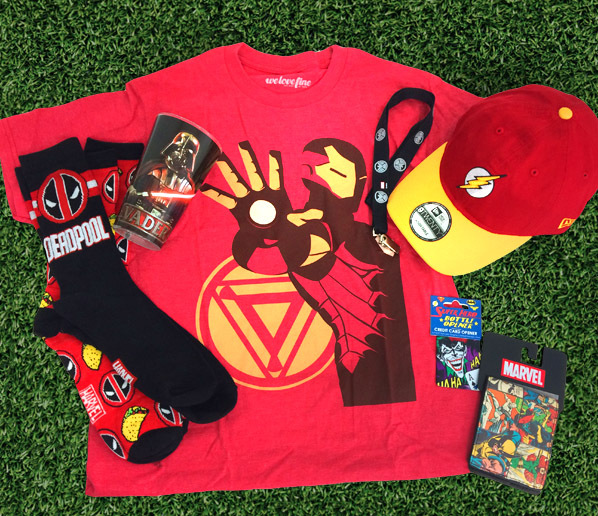 A mystery box jam packed with 8-12 expertly curated apparel items and accessories featuring a monthly superhero, team, or villain theme. 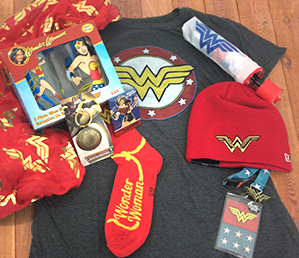 Gift shopping just got a whole lot easier. 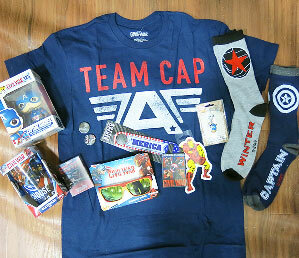 Our superhero boxes are cool stuff (and value!) 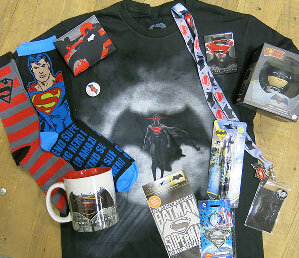 Choose from our great limited edition and ongoing themes that the geek in your life will absolutely love. 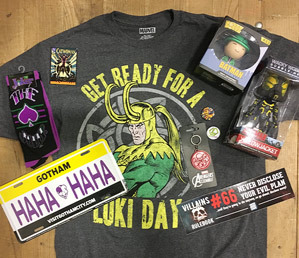 Unlike many other mystery boxes there is no need to subscribe! That way you only get the themes that you are interested in. 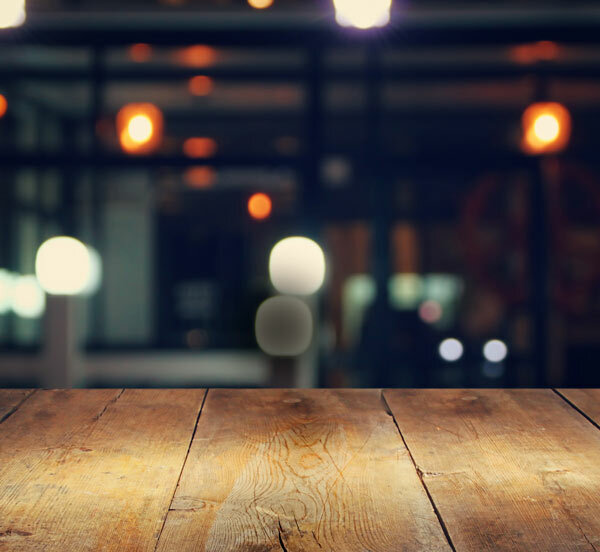 Check back often as we change our exclusive themes monthly! 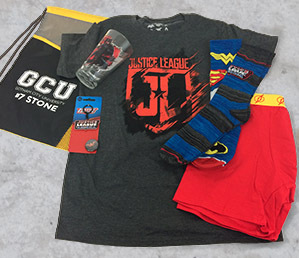 Our boxes start as low as $49 and are overflowing with $70-100 worth of officially licensed apparel, accessories, and much more. Get more bang for your buck with a gold edition box (if available). "Very good surprises and no junk whatsoever! 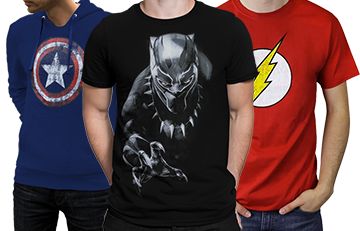 Very, very happy with the coolness..."
"SuperHeroStuff did not disappoint me at all... Great item after great item... I didnt want the box to end !" 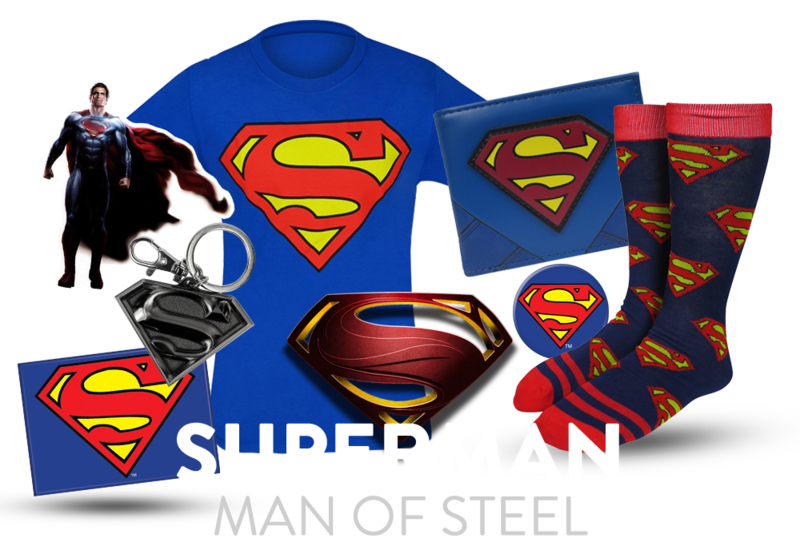 "Full of cool, unexpected items! Just the right thing to add momentos for the fan!" 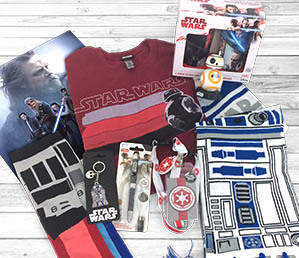 "This HeroBox is amazing!! I will use everything in this box unlike things in other boxes." 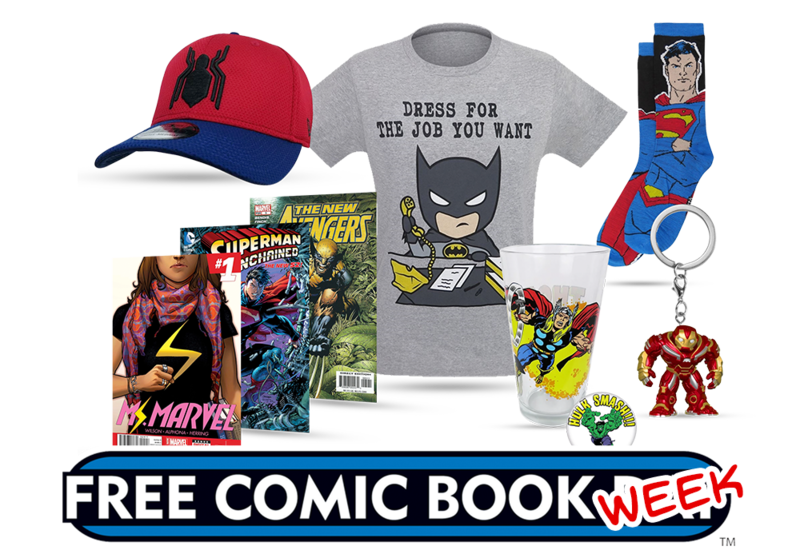 "You know that you will be getting high quality merchandise and not cheap promo items thrown together." "Loved it. 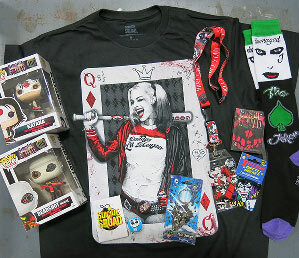 It came in before the date and had some great stuff from a pop figure shirt and many great things." 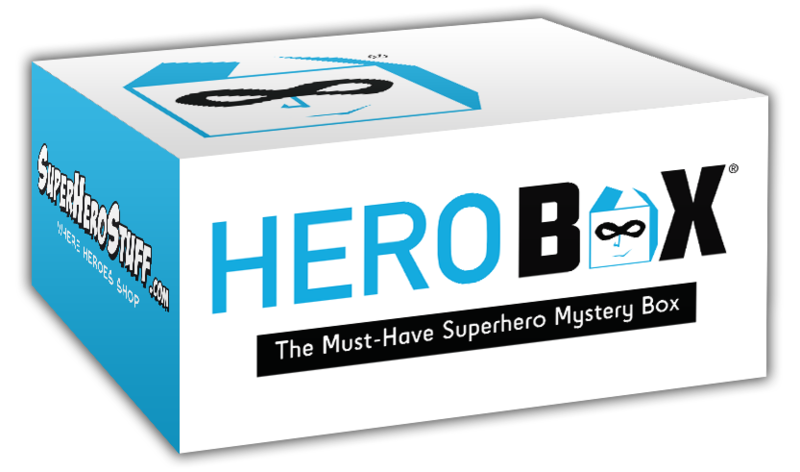 Our Hero Box is a mystery! You won’t know what’s inside until it gets to your front door! 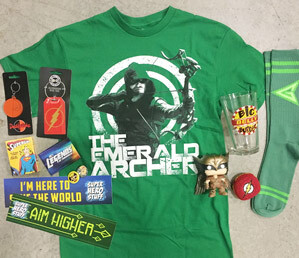 Every box is jam packed with $70-100 of SuperHeroStuff plus a few exclusive bonus items you won’t find anywhere else. 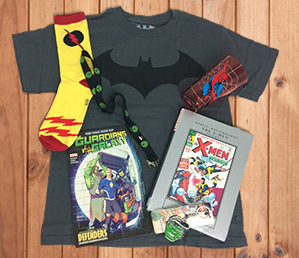 Themes include such pop-culture favorites as Marvel Comics, DC Comics, Star Wars, Star Trek, The Walking Dead, Game of Thrones, and more geeky faves that are sure to delight even the pickiest comic book fan, gamer, and overall nerd. Monthly Boxes Monthly boxes will have an exclusive theme and are announced, yup you guess it, at the beginning of each month. When the boxes are available for purchase we will advertise them in the weekly newsletter. 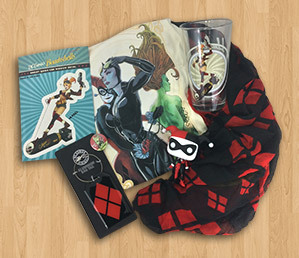 Once your order is placed, your box of super-awesomeness will ship out on it’s assigned date. These limited edition monthly boxes will be limited quantities. Character Boxes Character boxes feature a box filled with super-secret stuff featuring the hero of your choice! You will be able to order these at any time, and they ship 1-3 business days from your purchase date. This box does not change monthly but the items included and character choices will change periodically throughout the year. 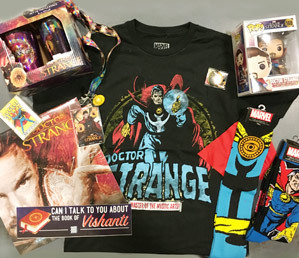 If you are waiting for a new box filled to the brim with stuff from your favorite character of choice, wait for the newsletter update that will alert you when the new edition is available. In the meantime, collect some of the other heroes that are available! 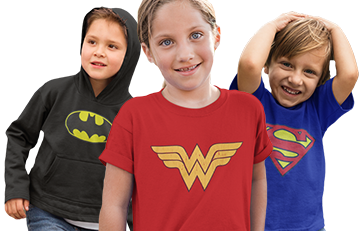 To find out about new and upcoming HeroBox® releases sign up for our email service above. You can unsubscribe at any time. 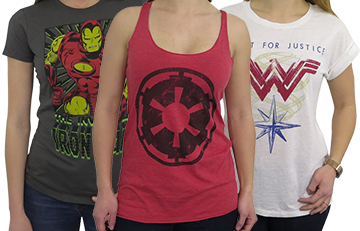 We cannot accept returns/exchanges on individual items from the HeroBox® unless it regards the sizing of your shirt. If you are looking to do an exchange for the size of your item, please follow the return instructions listed below (we cannot accept exchanges for different designs). If you are looking to receive a refund, all contents must be sent back to us from the HeroBox®, please follow the below instructions. On your packing slip you will find our return address sticker, note this is not a pre-paid postage label, you are required to pay the return shipping cost.